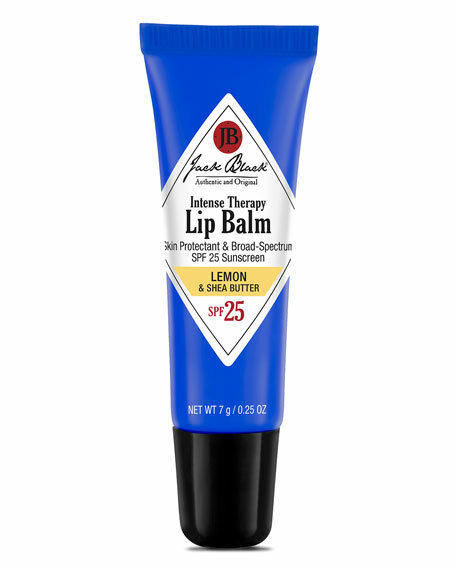 Jack Black Lemon & Shea Butter Intense Therapy Lip Balm SPF 25, 0.25 oz. Jack BlackLemon & Shea Butter Intense Therapy Lip Balm SPF 25, 0.25 oz. Enriched with superior skin conditioners and antioxidants, this emollient balm soothes and relieves dry, chapped, irritated lips and penetrates quickly to provide instant relief. Offers broad-spectrum sun protection with an SPF of 25; also guards against windburn and temperature extremes. To use, apply to lips whenever they feel dry or chapped. Use 30 minutes before going out in the sun to protect against damaging UVA and UVB rays.